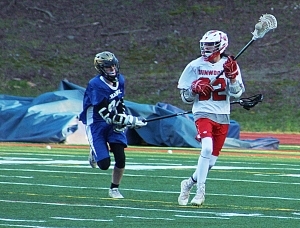 History is set to be made on Wednesday night at North DeKalb Stadium as the Dunwoody Wildcats host the first home lacrosse playoff game in program and DeKalb County Schools history. Coach Nathan Thornton’s Wildcats (9-4) clinched the home playoff game and second place in the Area 7 standings for Class 6A-7A with a 9-4 victory over Parkview two weeks ago. The Wildcats and North Paulding Wolfpack (6-9), the Area 3 No. 3 seed, clash at 6:00 pm at North DeKalb Stadium in Chamblee. It is the Wildcats second consecutive state playoff appearance. Dunwoody fell 15-0 to West Forsyth in the first round a year ago. Coach Montez Swinney’s Lady Wildcats (8-7) also reached the Class 6A-7A state playoffs for the second consecutive season as a 5-4 win over Norcross sealed the playoff berth. Dunwoody travels to Kennesaw Mountain (12-6) for a 5:30 pm match on Thursday. Dunwoody lost its first ever state playoff game in 2017 19-1 to Milton.